There are many different types of natural silk fabric and it is very easy to get confused with all of them. It depends on the type of weaving, quality of silk threads, the country where silk was manufactured, and many other factors. 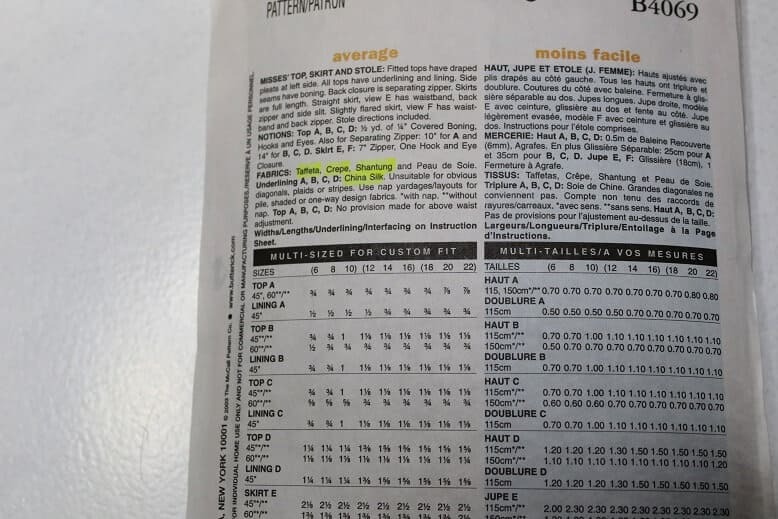 You can’t easily find many kinds of pure silk in fabric stores ( like Joann fabrics in USA and Fabricland in Canada for example) to compare them, to touch them and to feel the difference. But there are plenty of online stores that sell 100% silk. 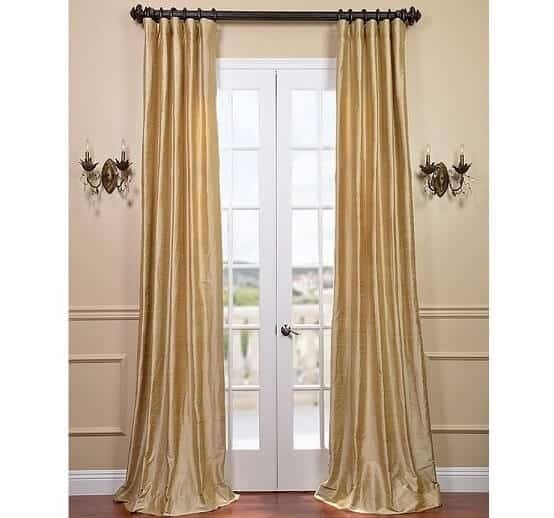 I prefer to buy pure silk fabric on Amazon, check out this link. Also, floral silk prints are very much in style right now. Note: If you make a purchase through my links on this post I’ll earn a small commission at no extra cost to you. I only promote things I use and love myself. To me, most distinguished types of silk fabric are Charmeuse, Dupioni, Chiffon, Organza, Raw Silk, Jersey Silk, Silk Mesh. I have all of them and can see the dissimilarity. But we have to know what all these terms mean. Let me explain why. 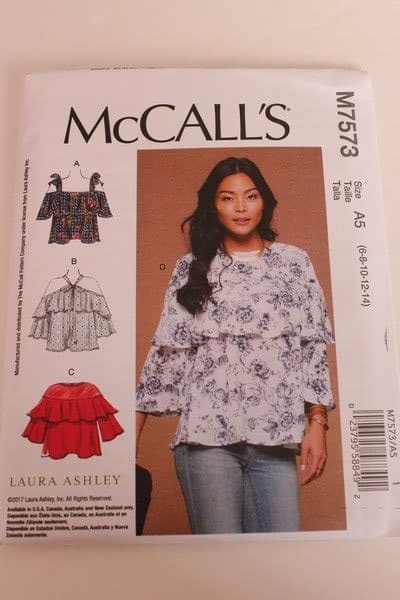 I buy very often sewing patterns from Joann fabrics – McCalls, Simplicity, Butterick, Vogue, New look, Burda. I use them quite a lot as a base for my sewing. 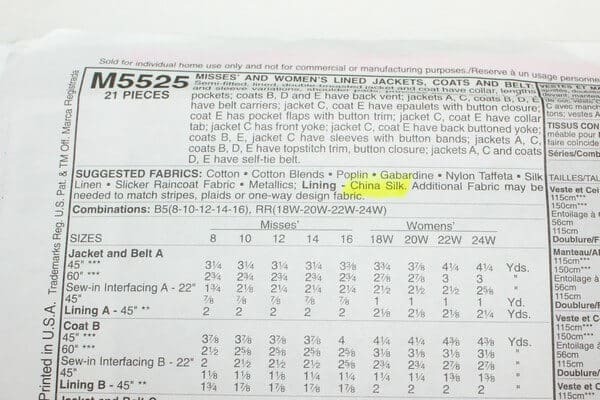 And they always have recommendations on the back of the envelope what fabric is suitable for the pattern. So look at these images that I made from some of my patterns. If you click on any photo it will open a bigger version of the image for you to see better. You can see that among suggested fabric there are always many types of silk. I wonder what you usually do when you read it? 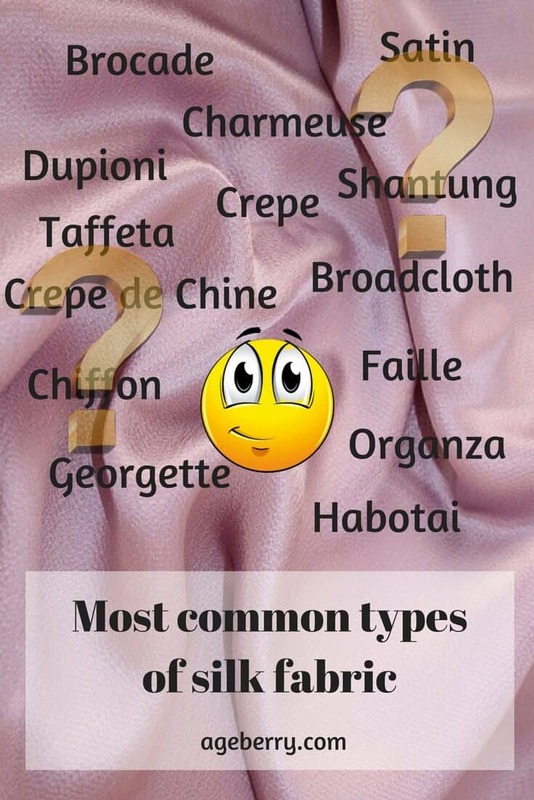 Do you know all these types of silk fabric for dresses, blouses and skirts? Or you just ignore it? Well, let’s try to research more and define them. 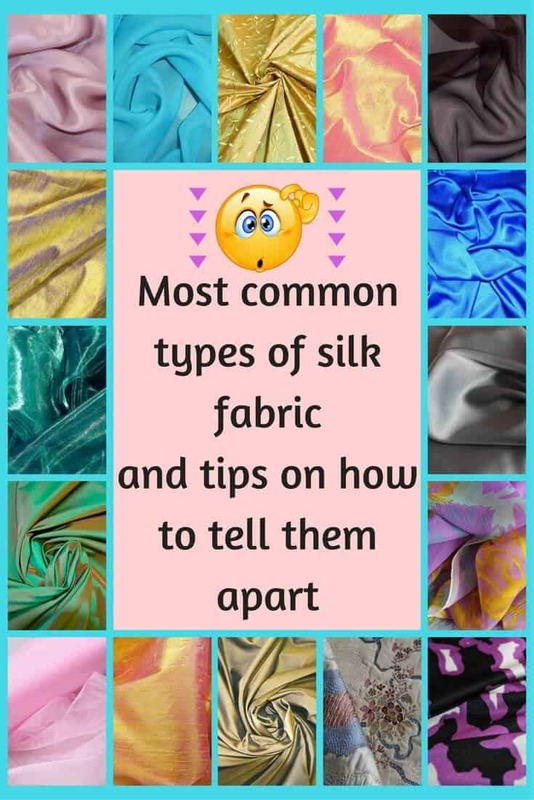 I made also many silk fabric images and will include them in this guide. Read this “fabricadabra” from Wikipedia. Do you understand something here? “Brocade is a class of richly decorative shuttle-woven fabrics, often made in colored silks and with or without gold and silver threads. Brocade is typically woven on a draw loom. It is a supplementary weft technique; that is, the ornamental brocading is produced by a supplementary, non-structural, weft in addition to the standard weft that holds the warp threads together. The purpose of this is to give the appearance that the weave was actually embroidered on. In Guatemala, brocade is the most popular technique used to decorate fabric woven by Maya weavers on backstrap looms. Well, this scientific description doesn’t help me much. 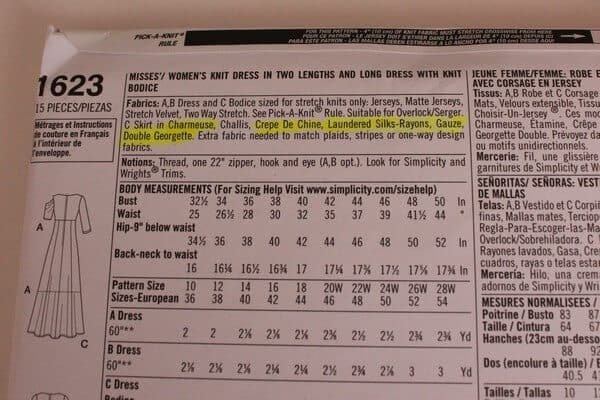 So, in the end, I found this link from www.burdastyle.com, which I understood easier. So as I understood, the main thing in Brocade weaving is “to achieve ornamental designs on the fabric that look like they are embroidered on”. 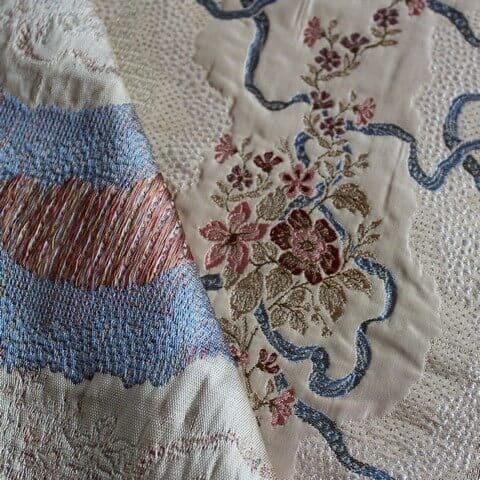 I found out also that Brocade fabric often has a floral or a geometric motif and some luster, sews easily and benefits from lining to maintain shape. It is used for evening gowns, wedding dresses, formal wear, costumes, and also for upholstery and draperies. Silk Brocade is a huge favorite of fashion designers. Brocade weaving, especially with gold and silver threads, has been an age-old tradition in India. And now some examples what we can sew with brocade. 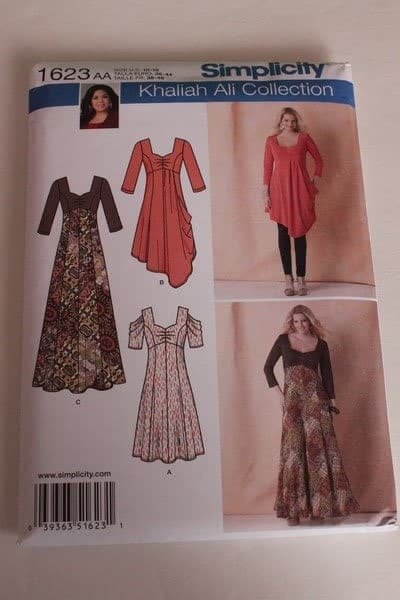 This Simplicity pattern 1691 recommends using Brocade for the dress C in the middle. 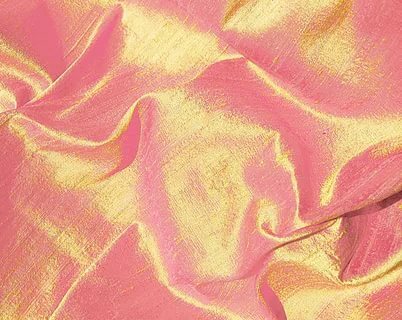 Now, what is Satin and how is it different from Sateen? 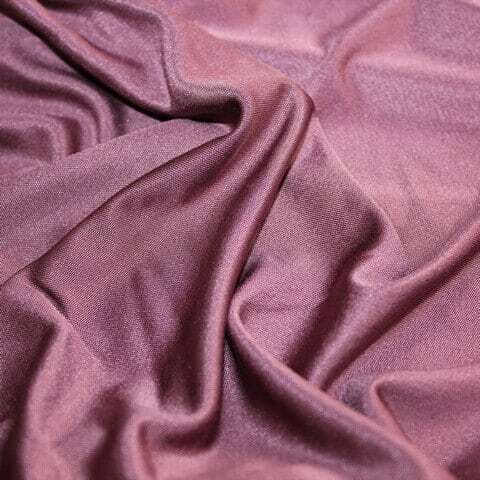 Silk Satin – one of the most noble and luxurious type of silk fabric. We appreciate Silk Satin for its smoothness and characteristic shine. It is flatteringly fluid fabric and drapes very well. 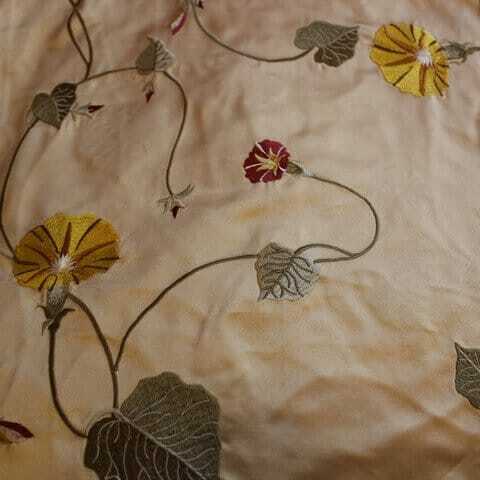 This fabric is dense with high thread count, can be lightweight, medium and heavyweight, firm, but delicate. The word Satin is often referred to not only natural silk: Satin can be produced in a variety of fibers. 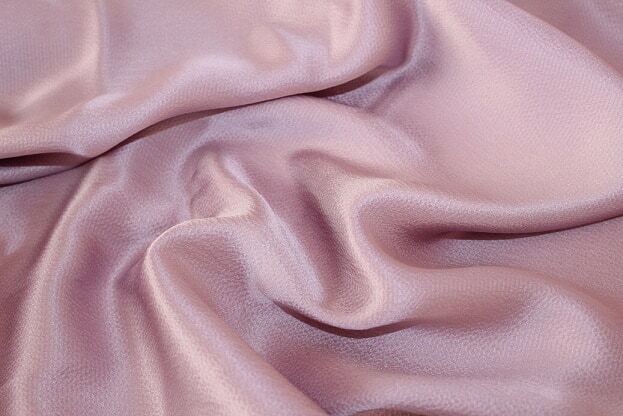 Satin is essentially the name of a weave and is not the name given to a specific raw material. 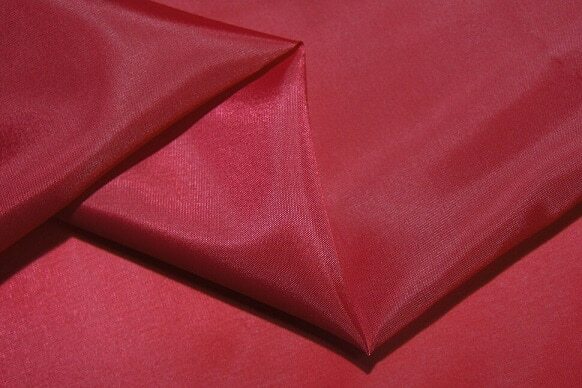 One side of Satin silk cloth has a lustrous sheen, is very shiny and smooth, and the other side is matte. When sewing with Satin you can show whichever side you like because it is completely reversible fabric. 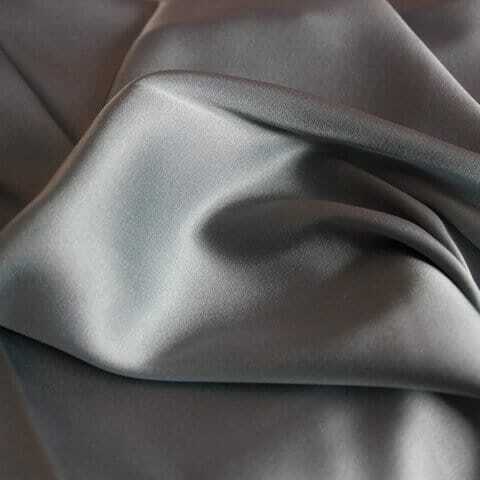 Silk Satin fabric looks and feels very luxurious and absolutely ideal for sewing the most elegant garments. 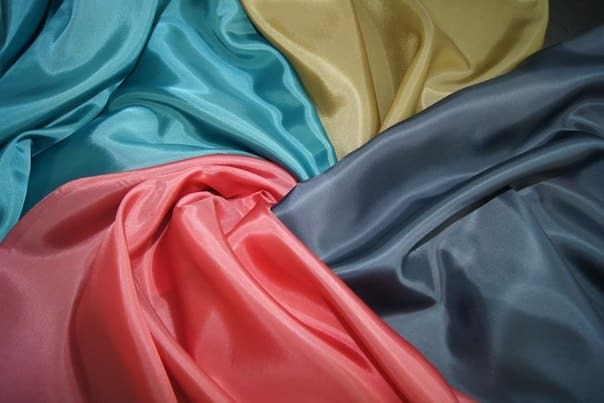 Satin is used to create bridal dresses, evening gowns, lingerie and bedding. In menswear Satin is usually used on tuxedo lapels and trimmings. And what is interesting, silk Charmeuse is Satin fabric, but very lightweight. Satin fabric that is heavyweight with a very high thread count called Duchess Satin. There are few other types of Satin, but I didn’t see them mentioned in my sewing patterns, so I skip them for now. Two more thoughts though. There is also word Sateen. It is used for fabric with the same particular kind of textile weave but made from cotton threads. Satin fabric is quite easy to handle if you follow some tips for sewing slippery fabric. A pattern that suggests using Satin are this one below. It is mediumweight silk fabric woven in a plain weave, has slightly irregular surface, uneven ribbed “crisp” texture, it has some sheen but not very shiny. I noticed that it wrinkles easily and abundantly. But it is easy to sew. And now some pattern which recommends using Shantung. 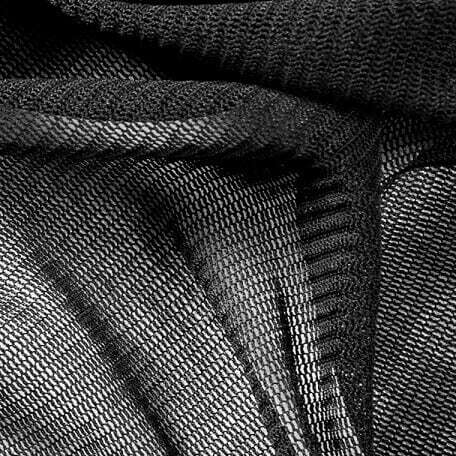 Dupioni (also sometimes Douppioni or Dupion) is a plain weave crisp type silk fabric. 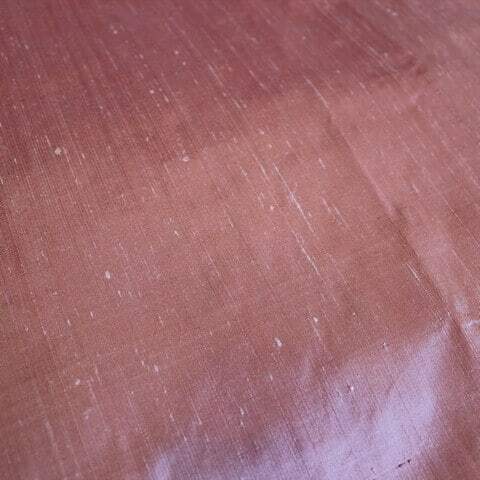 It is similar to Shantung, but a little thicker and with a greater crosswise irregularities and bumps in texture called slubs. Dupioni is often woven from two different colors of threads and because of that it shimmers or changes color in the light. It does have a tendency to wrinkle and unravel easily but is usually easy to sew. The fabric is reversible, so both sides of the cloth can be visible in a finished garment. Dupioni is popular in wedding and evening wear, is suitable for prom dresses, women’s suits and can be used in upholstery and drapery. But dupioni is quite stiff fabric and is not good for patterns that require fluid drapey fabrics that flows very well around the body. Silk Dupioni comes in home decoration version, which is usually heavier and wider. 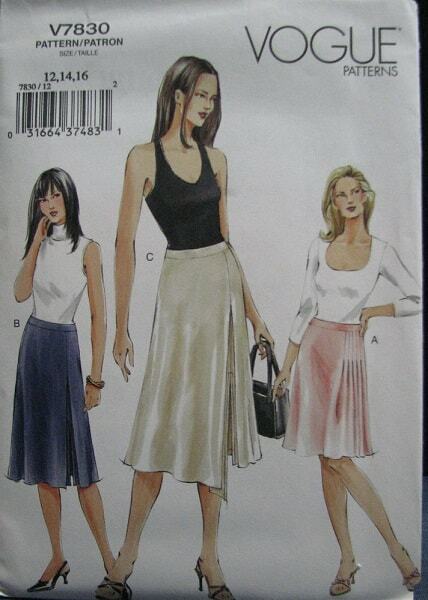 I didn’t find Dupioni in suggested fabric for my sewing patterns. But I used it a lot to make blouses, dresses and … pillowcases. 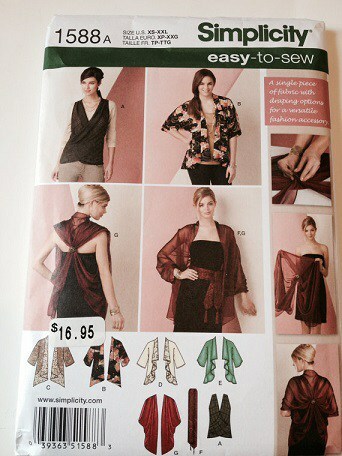 Perhaps, you should read my other popular tutorials also if you are interested in sewing. 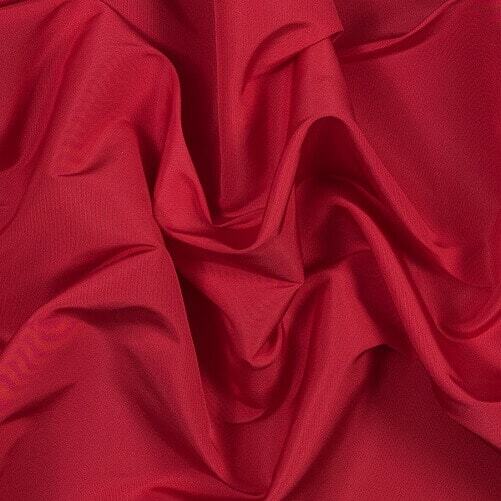 Taffeta looks like Satin upon first glance because it has a nice sheen but when you touch it you feel that it has a stiff texture. It holds its shape very well. It is a tightly woven, plain weave material. Usually gowns and suits made from Taffeta are lined with another silk fabric which is softer and smoother. If you walk in a long dress made from silk Taffeta you may notice that the fabric makes a funny hissing noise. Dresses made from Taffeta are usually quite heavy. Wikipedia says that “it is also widely used in the manufacture of corsets and corsetry: it yields a more starched-like type of cloth that holds its shape better than many other fabrics “. Being a stiff silk fabric, Taffeta doesn’t drape very well. It also unravels a lot and doesn’t ease well. But is very easy to sew. 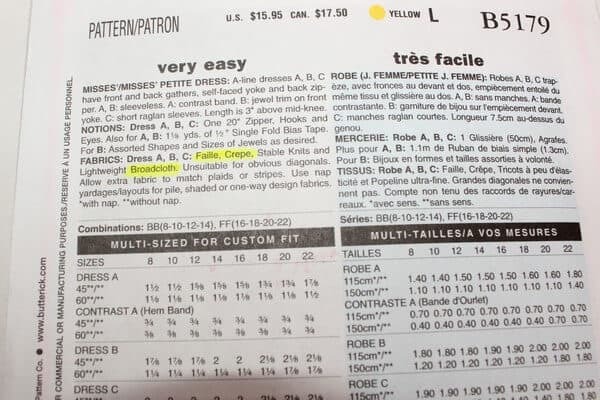 Here is the pattern that recommends using Taffeta. 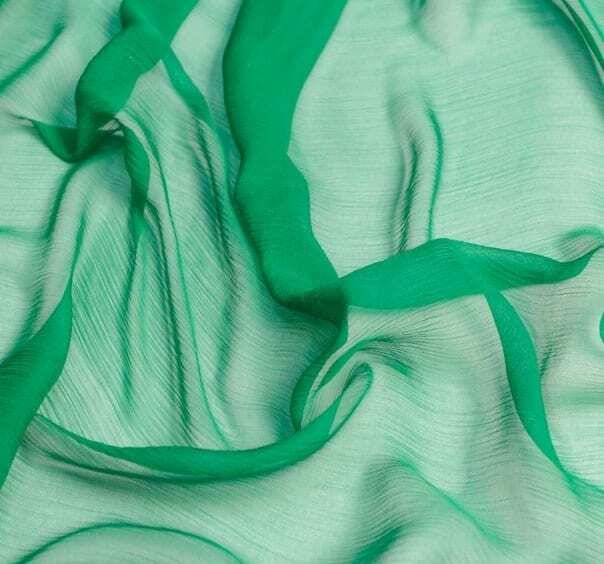 Silk Crepe is a woven fabric that usually has a crinkled or granular surface, with a sort of small folds or ridges. The tight weaving and twisting of the fibers prior to weaving are responsible for this pebble-like texture. Crepe is usually lightweight cloth and has a lustrous sheen. It drapes very well and is suitable for blouses, dresses, skirts, scarfs, any patterns that require flowing fabric. Both sides of the fabric look and feel the same. Crepe fabric doesn’t unravel easily and is a little stretchy and quite wrinkle resistant because of its texture. Easy to sew. Here is an example what can be made with Crepe. 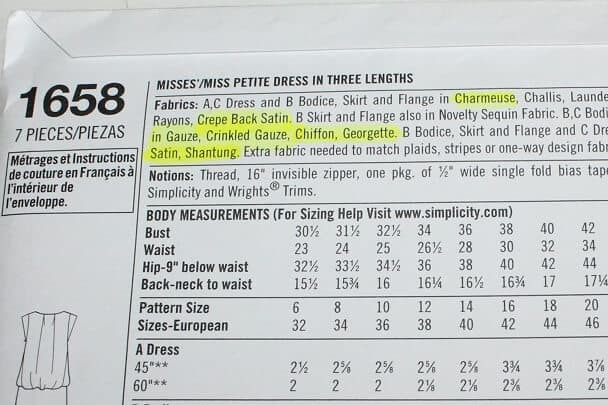 I see that Crepe de Chine is quite popular among patterns makers. Here is one example. “Fine, lightweight, plain weave, crêpe fabric, usually having two highly twisted S and two highly twisted Z yarns alternately in both warp and weft. Made of crepe yarn, silk georgette has a grainy texture, a sheer feel, and a thin, very dry hand. It is heavier than chiffon, and is similar to silk crepe, but is not as soft or lustrous as crepe. Georgette is durable, but snags easily. Drapes very fluidly, and falls into soft ripples. 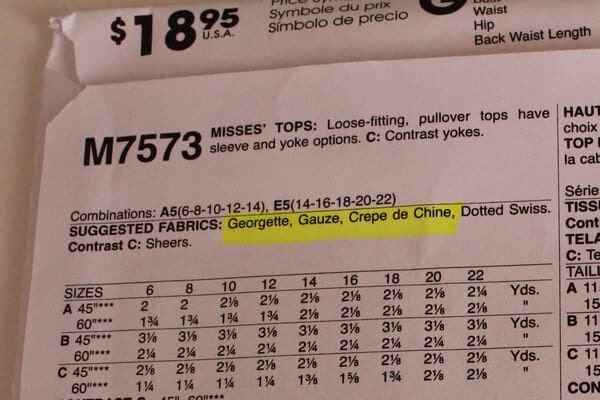 So Georgette fabric (like Crepe) has a textured surface, is sheer and similar to chiffon but stronger and a little more opaque. If you want flowing look but not so transparent as with Chiffon, use Georgette. Dresses, blouses, flared skirts, scarves, evening and bridal gowns are some of the most common garments made with Georgette. There is also Double Georgette Silk fabric which is heavier than Georgette providing extra weight to garments. Double Georgette is considered medium weight sheer fabric with good draping abilities. 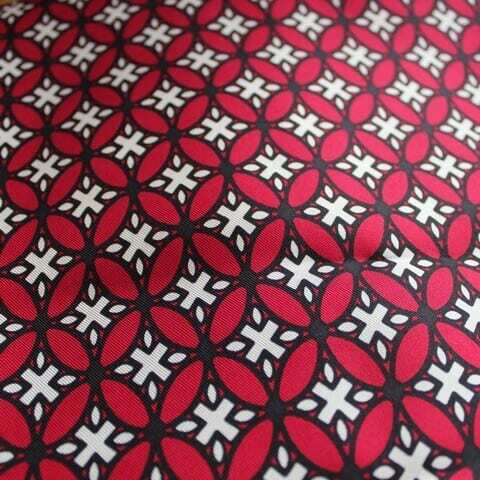 Now one example of a pattern that suggests using this fabric. 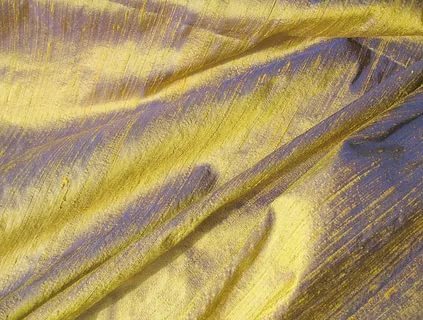 This silk fabric has an even, most basic, plain weave of very fine silk threads, it has some sheen, is very lightweight, not sheer but thin, soft, shimmering and smooth, looks the same on both sides. 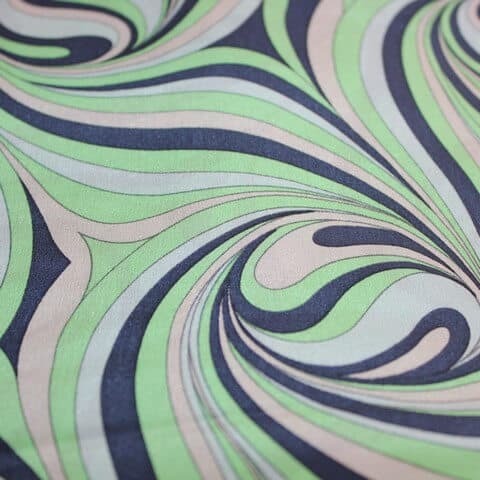 This is the classic silk fabric since nothing has changed in its production over the centuries. 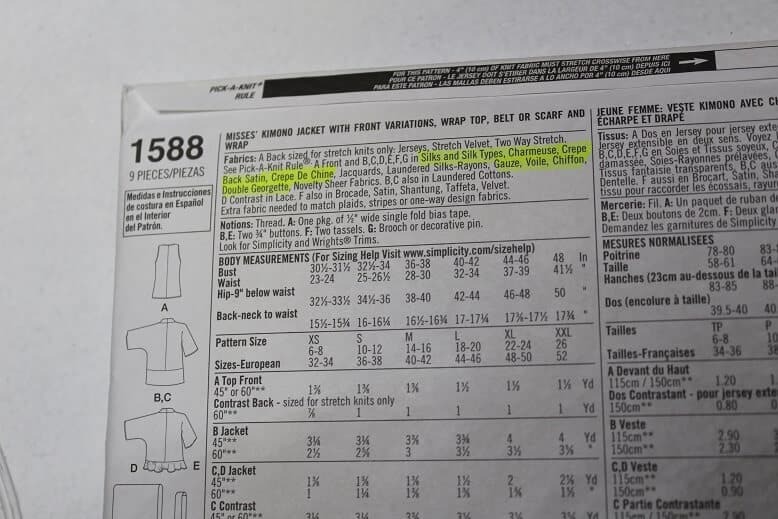 I noticed that it is a little less expensive to buy than other silks, maybe because of this it is commonly used as a lining for luxury garments instead of polyester. To me silk Habotai looks like that polyester lining that we can easily find in any fabric store. Silk Habotai is a very flowing fabric and in the same time has a slightly crisp feel. It can be used not only for lining but also for dresses, blouses, lingerie, scarves, swim cover-ups, it is widely used to make kimonos. 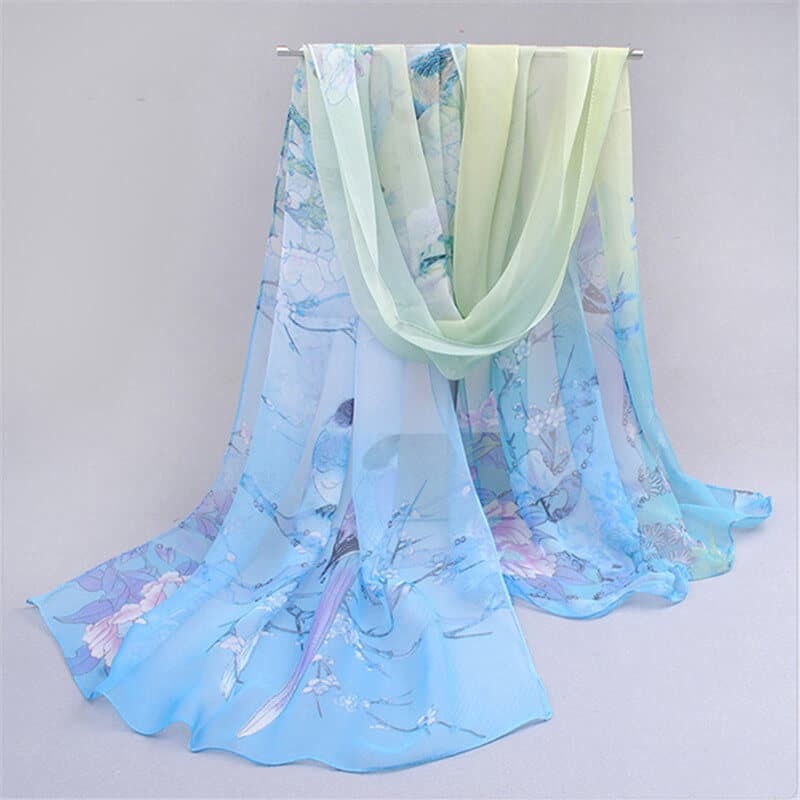 Another common use for silk Habotai is silk painting because it has smooth surface and it is quite easy to dye. Silk Habotai has a tendency to fray but otherwise it is quite manageable to sew. Here are some example from my patterns. 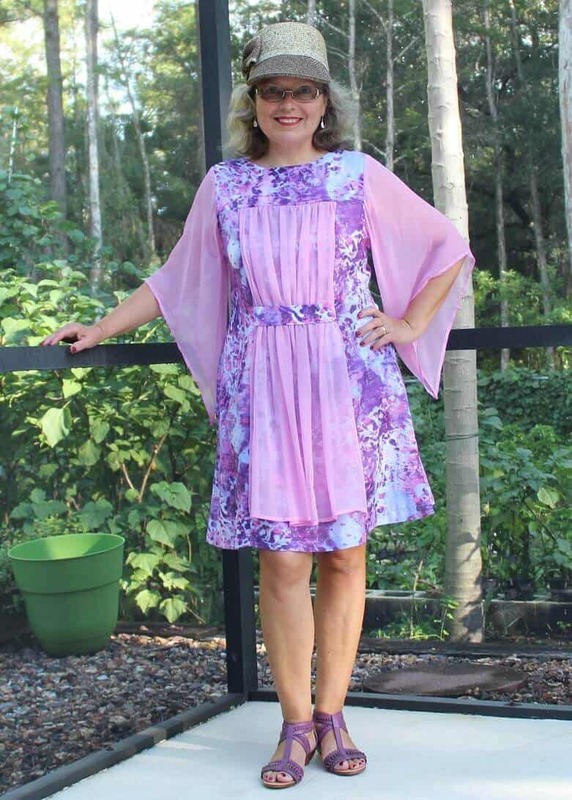 It seems to me everybody knows that Chiffon is sheer silk fabric so I don’t need to say much here. Silk Chiffon is sheer see-through, lightweight, fine, delicate fabric with a soft, beautiful drape. It can have a nice sheen or be matte. 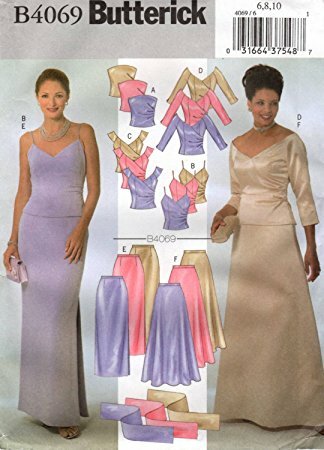 Chiffon garments usually require lining or backing. It is widely used for making scarves. Drapes beautifully, falling in soft, languid ripples. Chiffon can be difficult to work with because it is very thin, fluid and slippery. And below are some images of my garments I made from silk chiffon fabric. 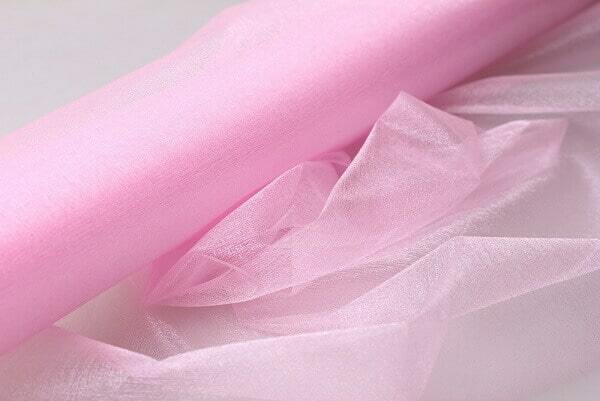 We usually are more familiar with polyester and nylon Organza which are readily available in any fabric store. But I don’t like synthetic so I use only 100% silk Organza. 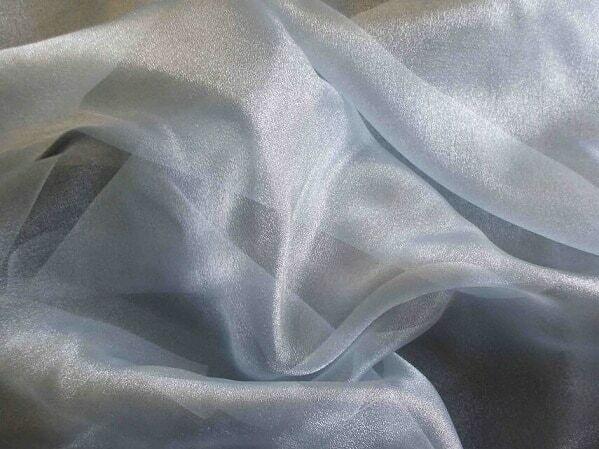 Silk Organza is fully transparent, it has a crisp feel and a flat, smooth texture. Usually it has a nice sheen. In spite of its delicate appearance, it is very strong and durable. It has so many uses in the sewing room! It is great for bridal and evening wear, costumes, home decorating. 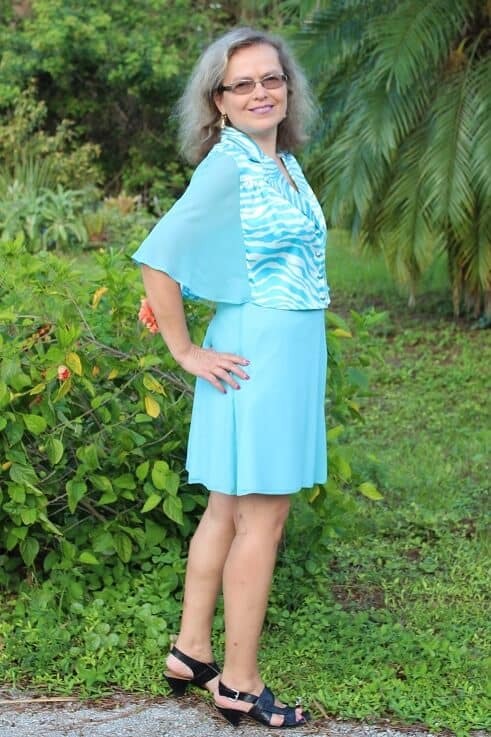 It can be used for lining and interfacing because it stabilizes and adds practically weightless support for dresses and skirts preventing fabric from stretching and it also prevents wrinkles to some degree. What I like the most, Silk Organza unlike any other silk fabrics resists high temperatures and steam ironing and because of this I really love to use silk Organza as a regular press cloth for ironing. The absolutely best thing is that I can see through it and iron hems, darts and other silk pattern pieces without any fear that drops of water from my iron will come to my precious silk and spot it exactly in the most visible place. Organza also saves my silk from iron burns. Actually, with Organza as a press cloth, I iron my silk fabric with cotton settings and full steam. It seems to me my iron doesn’t get really hot for cotton and linen. I also like very much to use Organza for machine embroidery. 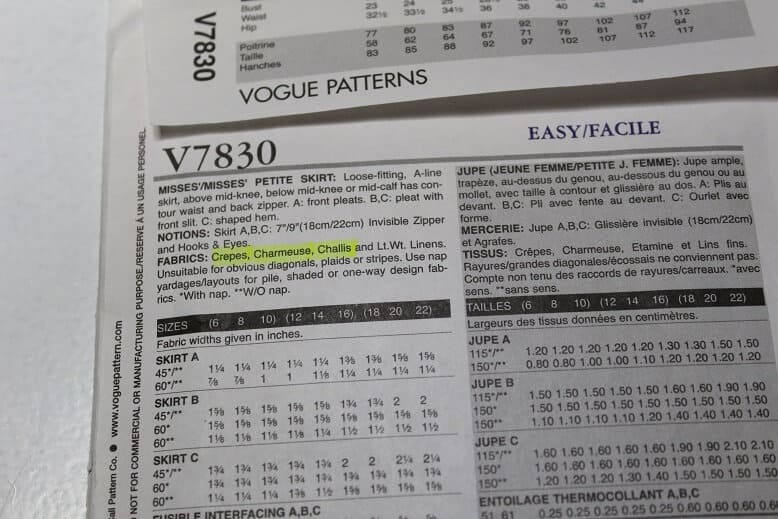 Faille is sometimes a recommended fabric on the back of a pattern envelope. 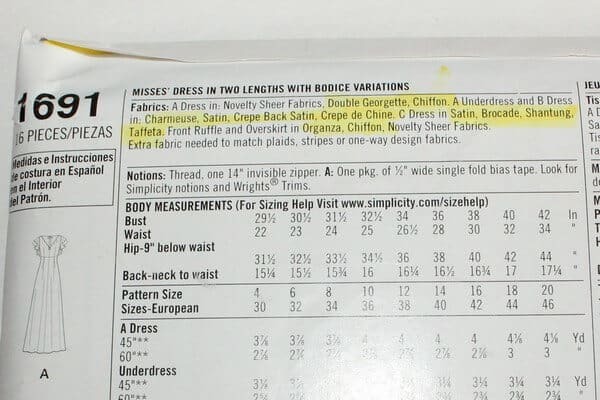 So I understand that Faille is silk with some kind of ribbed texture, but how is it different from Crepe? 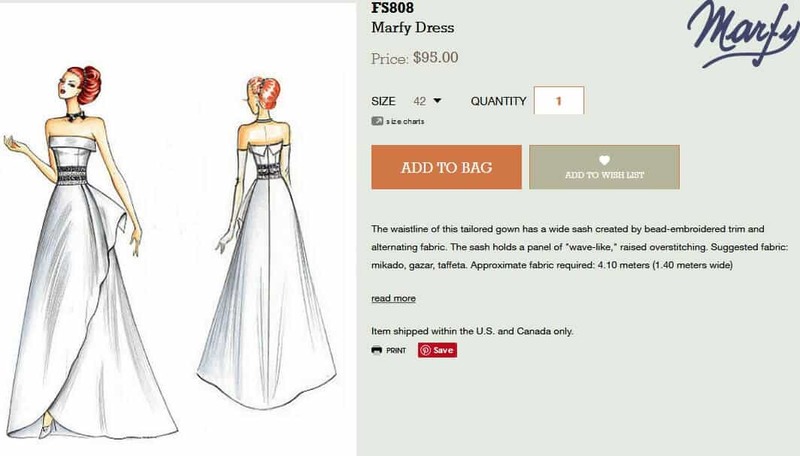 And since there does not seem to be a common opinion about this it is also likely different fabric manufacturers will have their own opinion about what makes faille. 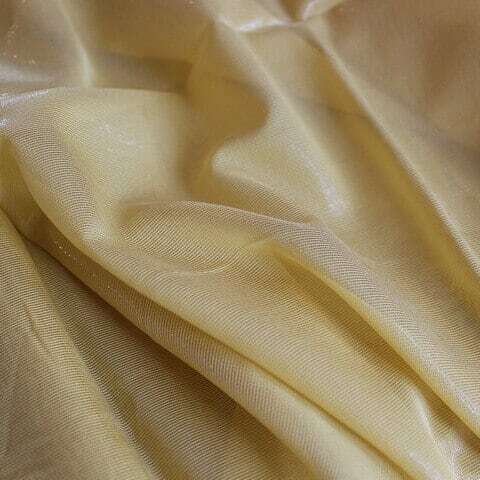 Silk Broadcloth is a mediumweight woven fabric with fine, tight, even, plain weave. It has a very little sheen, slightly crisp hand, and opaque surface. Drapes pretty well. To me, it looks very much like light soft cotton fabric. An interesting thing about this silk is that it can be machine washed at any water temperature but it shrinks. It is used to make men’s shirts, but great for blouses and dresses also. 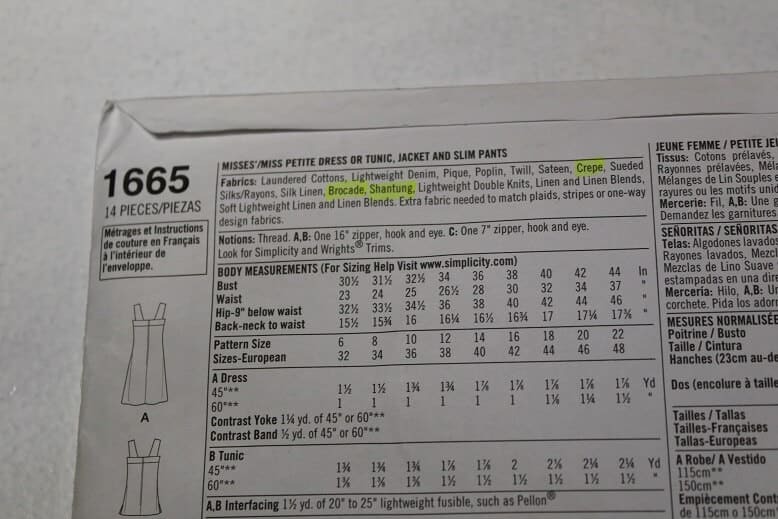 The example of a pattern that suggests using Broadcloth is the same as above for silk Faille. Raw Silk, also known as Silk Noil, is something different with a bit of texture to add to your collection of silk fabrics. 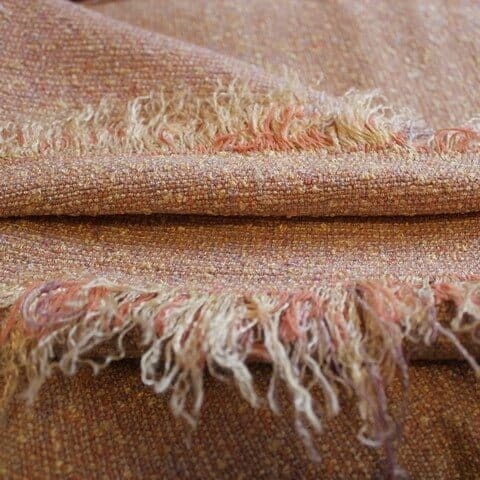 Slight imperfections of the weave in the fabric are characteristic of Raw Silk. Non-slippery and not shiny texture sets Raw Silk apart from the rest. Raw Silk usually has not been chemically processed. To me, Raw silk fabric looks a little like thin wool but it drapes better than wool. Raw Silk is made from short fibers left after combing and carding so it doesn’t shine like many other silk fabrics. If you buy Raw Silk you may notice that it has an odd smell because initially, it has a lot of sericin (a naturally occurring protein) in it; the smell dissipates after washing. It can be machine washed on gentle and dried on low, but this will cause a faded, “weathered” look. If you prefer bright colors, dry clean or hand wash.
You can buy Raw Silk for a very reasonable price as it is one of the least expensive silks. This fabric takes dies very well, is easy to work with, sews up beautifully. It is perfect for casual garments, because it is soft and breathable, it is also great for bedding, may be used for quilting, some people use it even for diaper’s lining. Silk Gauze is sheer silk fabric similar to soft floaty Chiffon but thinner, it is extremely lightweight, sheer and delicate, loosely woven of fine but very strong silk threads. Gauze has a very soft hand and floaty drape. It can be used to make light as air wedding veils, scarves, stoles, boleros, even dresses. 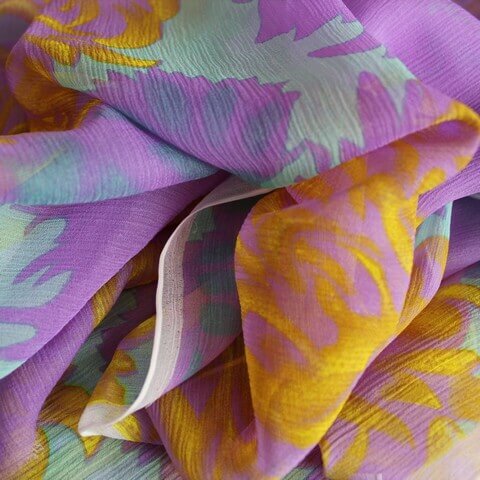 It is the most difficult of all types of silk fabrics to cut and sew because it is almost weightless, it distorts easily, it stretches a lot along the bias and it is prone to snags. Silk Gazar is completely different from Silk Gauze. Gazar has a crisp hand and a smooth texture and is much used in bridal and evening wear. 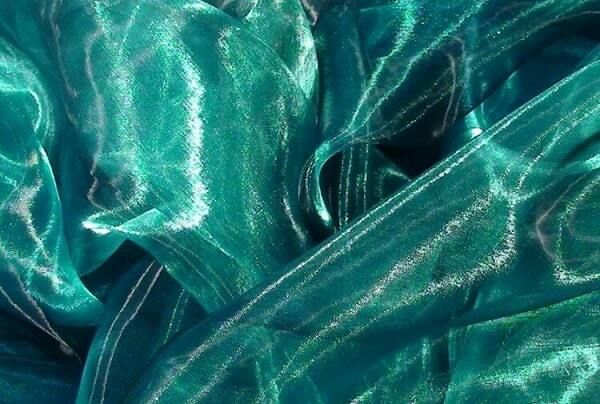 Gazar has a lot of sheen and can be considered just a Satin version of Organza. Gazar, like Silk Organza, is a washable fabric, that withstands high heat and steam. Easy to sew. Silk Mesh is a lightweight, very fine netting, as light as a spider’s web. 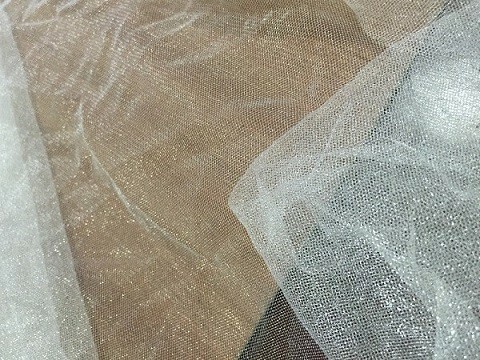 Another word for this fabric is Tulle. Silk Mesh may be loosely woven or knitted fabric which has closely spaced holes. This open-hole silk fabric may be used for athletic wear, casual summer apparel, and even lingerie. But it is best known as the material for wedding veils. I really like to sew Silk Knits. This fabric is not woven, but machine-knitted. The best feature of it is stretchiness (or elasticity). Most knits stretch in all directions: up and down as well as across. 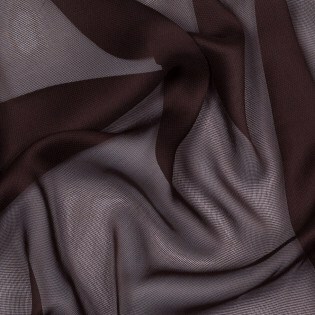 Silk Knit fabric is light, flexible, soft, very pleasant to touch and wear (as any other silk) and also very versatile. You can use it to sew comfortable dresses, trendy tops and jumpsuits, cozy leggings, lingerie, and much more. Knit fabric usually doesn’t unravel, so the edges often can be left unfinished. And one feature that I especially like is the fact that Silk Knit fabric doesn’t wrinkle as silk woven fabrics. 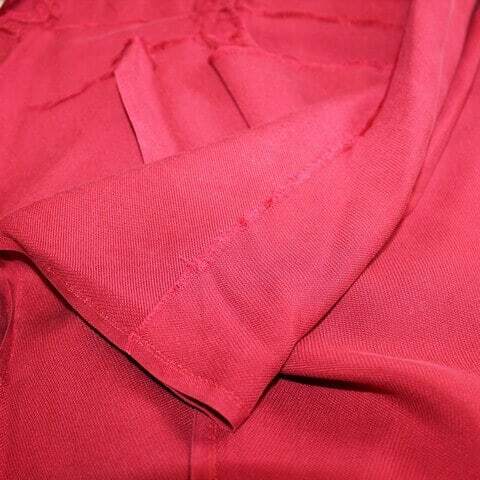 Most kinds of silk fabric are quite wrinkly and after few hours of wear silk garments look wrinkled and rumpled. But not outfits made from Silk Knits! They always look polished and well-ironed. Actually, they don’t even require ironing. Pure silk fabric is fabulous on its own but when it is enhanced with hand or machine embroidery the results are really spectacular. 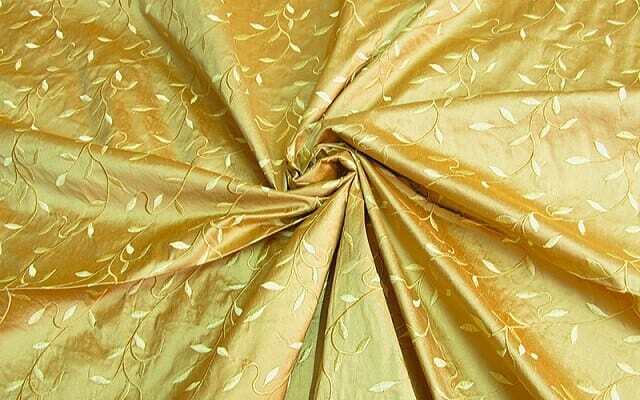 We can find stunning motifs on sturdy types of silk fabric like Dupioni, Taffeta, Shantung, Crepe, Organza, and Satin. Embroidery may incorporate also materials such as pearls, beads, gemstones, sequins, and ribbons. Embroidered silks are commonly used for home decoration but if you want to show off at glamorous occasions you can use embroidered silk fabric to make fashionable garments like evening coats, skirts, tops, and dresses. Well, my guide is getting too long right now for an article on a blog. So I will stop and advice you to explore reading options suggested below. There are plenty of resources to learn more about different types of fabric. I highly recommend the best-selling fabric guide by Sandra Betzina All New Fabric Savvy: How to Choose & Use Fabrics. Now they can make polyester and rayon fabric similar to silk in its appearance. 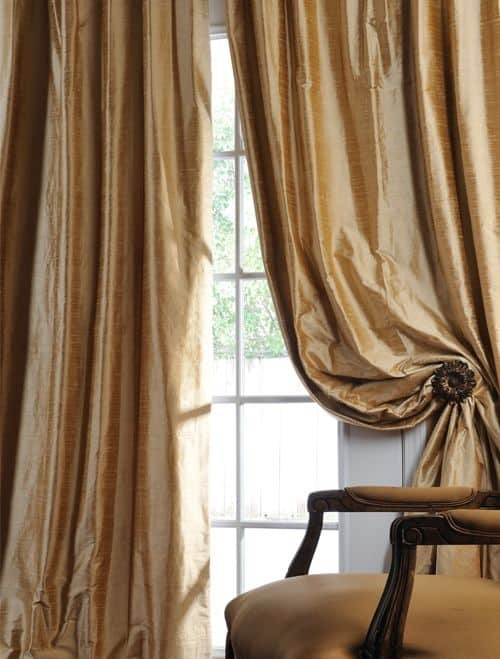 Artificial silk looks sometimes even better than natural – it is wrinkle resistant and really shiny. But remember that polyester is a pure chemical product of the oil industry. If I wear a polyester dress on a hot summer day I feel like I am inside of a plastic bottle. Very uncomfortable feeling. So I never make clothes from polyester fabric. Check my article “The chemicals we wear everywhere” and decide for yourself if you agree with me or not. 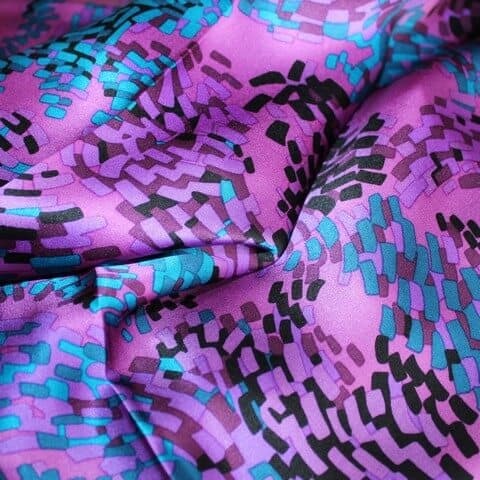 What types of silk do you use in your sewing projects? Can you add something to my descriptions so we will understand better dissimilarities of different types of silk cloth? Did you like this guide? If you want to save it for future reference and to use it later when you are ready to sew something from silk, pin this image to your sewing board on Pinterest and follow me on Pinterest for more tips, tutorials and inspiration. Say HI on social media! Faille is used for Men’s ties. Oh, really? Thank you very much! My husband has so many of them (and wearing none, actually). I am going to look right now at his ties. What about grosgrain silk? Textured kind of like corduroy. Oh, I know there are many other types of silk that I didn’t mention (and maybe I didn’t even hear about some of them). I wanted to write mostly about silk fabric that pattern companies recommend to use for sewing women clothes. So I have never seen grosgrain silk on pattern envelopes. But maybe I should write about it also? I see it’s used a lot for making men clothes and accessories. Can I help you to become an expert in sewing? "25 time-saving gadgets that will make sewing better, smarter and faster than ever"
Thank you! Please, check your email and also Spam and Promotions folders for my Welcome email from olga@ageberry.com with a link to the bonus guide!